My yoga journey began in 1992 at UC Santa Cruz, with my beloved first yoga instructor, Julie Kimball. She was a direct student of B.K.S. Iyengar and had the most brilliant smile. I am grateful that she gave me such a strong and loving foundation in yoga. Through her, I learned the incredible structural precision of Iyengar style yoga, but with her very loving and softly feminine guidance, which is a far cry from the infamously militant style of many Iyengar instructors. Julie influenced me in many ways. I teach much of the alignment skills she taught me, as well as some of the breath work practices that go along with the asana. Perhaps most influential to my teaching style was her ability to laugh and be goofy in the midst of difficult asanas. I'm always looking for or telling a good joke right at the moment the class begins to groan with exertion! I studied yoga with Julie for the entire time I was in college and Yoga became a significant part of my major of Bachelor of Arts. At that time, UCSC had programs which enabled students to be able to create their own major. Though I began my studies at UCSC as a journalism major, I realized half way through that I needed to broaden my perspective and the only way to explore what was most interesting to me was to create my major. So I did. With the guidance of some truly amazing mentors and gurus (Mel Wong, Jude Todd and Julie Kimball) I created "Somatic Creativity" as my BA. It was the study of the body as a the vehicle of inspiration and the mode by which we find understanding of all things, intellectual and creative. I combined classes in dance, yoga, theater, psychology and anthropology to create my major. And truly, it is what I have continued to study and teach ever since! 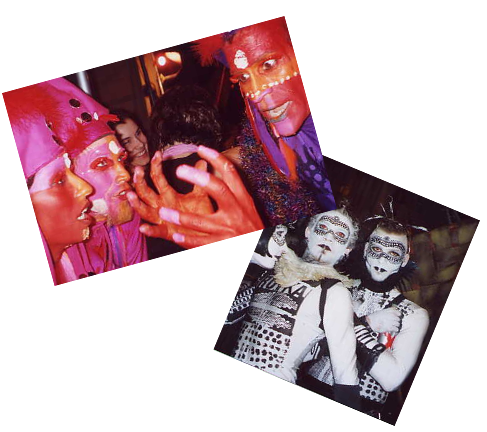 After college in 1996, I moved to San Francisco and became immersed in the performance art and theater scene. I danced, acted, was a part of artistic political activism, and founded a nonprofit circus of 500 people, which I directed and performed in for 10 years. All the projects I led and performances I was involved in had elements of yoga. When the circus performed at festivals around California, I taught yoga to festival goers. When I was part of a dance show or theater piece, I would lead yoga warm ups. When political activism got really heavy (like at the WTO rallies in Seattle), I would call upon my skills of meditation and yoga to ground me as tear gas flew past me and thousands of people stampeded through the streets. My days of directing the circus and performance came to a close (or has it ever come to a close?) when I began having children. With the birth of my first child in 2004 came an unexpected new journey in my life. The birth was long and became complicated and my son spent the first 3 weeks of his life in the Infant Critical Care Unit of Oakland Children's Hospital. None of the experts could give us any information as to what exactly was wrong or what the outcome would be, but it was sure that somehow he would be different. Within the first year of life, it was clear my son was not developing typically and at age 3 was diagnosed with autism and ataxic cerebral palsy. At the same time as my son’s diagnosis, we also welcomed my daughter to the world and moved to Sebastopol. As a new mother, living in a new community and dealing with all the challenges of raising a child with special needs, I called upon my deepest resources: yoga, meditation and prayer. Of all the incredible projects, businesses and nonprofits I've been a part of, mothering has been the most profound. I've found that I am able to greet the tests and hurdles that parenting encounters with a steadiness and patience that I believe has developed through my practices. Yoga has kept me a loving, limber and strong mother! Strength of body to lift a 130 pound boy who has trouble walking and flexibility of mind to understand different perspectives of both a stubborn neurotypical child and a neurologically different child. My daughter is a neurotypical child, as they say in the autism world, but there are plenty of challenges raising a "normal" preteen girl! As all parents out there know, raising children is the greatest school, vocation, and spiritual practice and my yoga and meditation are my go-to for every situation. It's amazing what one big conscious breath can do for an impending argument with a 12 year old hormonal girl! My next step in my journey brought me to Tri Yoga, which represented a rebirth for me. I had studied many different styles of yoga and was on a hiatus from teaching while I was having my children. At the time my daughter stopped breast feeding, I found my way back to my yoga practices and teaching again. The first studio I stepped into was the Devi Yoga Center in Sebastopol, where Kashi Ananda teaches the amazingly articulate style of Tri Yoga. I discovered an entirely new way to practice yoga when I began to study Tri Yoga, founded by a woman, Kali Ray. It is very feminine, flowing, and pays attention to detail like no other style of yoga I've practiced. Through studying with Kashi, I learned the undulation of yoga, and the spinal fluidity that was possible BETWEEN asana postures. It really changed my life! At the same time as finding Tri Yoga, I also decided I needed to get my teaching certificate. I had been teaching yoga for nearly 18 years without certification, but I felt it was an important step to take in coming back to yoga as my career. So after doing a fair amount of research, I decided to attend the Yandara Institute in Baja, Mexico. There, I found community and family beyond what I could of hoped for. Although I was seasoned, I still learned a tremendous amount about yoga and meditation and most importantly, realized for the first time that I am a yogi. My path with yoga has led me to DeAnna Batdorff and the dhyana Center. DeAnna was first my family's practitioner and a sweet friend. When she moved her center to the lofts of the Basso Building on Main Street, I approached her with a proposal that yoga be part of the offerings at the new dhyana Center. She agreed and brought me on as director of yoga programming and as they say, "the rest is herstory!" It's been almost 9 years now and we've developed such an inspirational thousand petaled lotus called the dhyana Center of Ayurvedic Education! We never really know where each life choice we make will lead us. We have to trust in our innate ability to know which direction to go from our body's knowledge, from the inspiration that comes to us from a place other than our brain and logical mind. I give thanks I found yoga and meditation to guide me through the many stages of my life. And it is with so much pleasure and honor that I pass on what I've been taught so others may benefit from these life skills and practices.